At age 27, Karen succeeded Albert Saurini, joining the ISO from the renowned New World Symphony, where she played in its inaugural season under the direction of Michael Tilson Thomas. She has also held positions with the Harrisburg (PA) and Annapolis (MD) Symphonies. 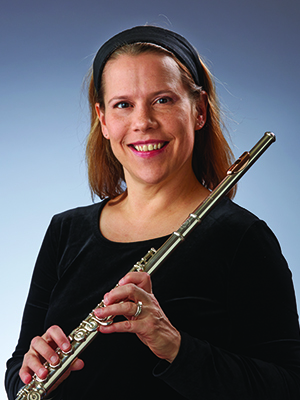 Karen is the Associate Professor of Flute and Artist-in-Residence at Butler University’s Jordan College of the Arts. She has also taught at Indiana University’s Jacobs School of Music, the University of Illinois in Champaign-Urbana and the Grand Teton Festival Orchestral Seminar. She has taught numerous masterclasses, most recently at Northwestern University in Evanston, Illinois and the Royal Academy of Music in London. Her students have won a number of prestigious flute and piccolo competitions and many have gone on to have successful musical careers in teaching, music administration and performance. In 2009, Karen authored Flute for Dummies (John Wiley & Sons). Now in its second printing, the book has been translated into Portuguese and Persian and was called “a must have for anyone who owns a flute” by Sir James Galway. She has recorded for NPR, Koss, London/Decca and Arabesque and her cadenzas for Mozart’s Flute Concerto in G major, K.313 have been published by Southern Music. An avid supporter of community musical organizations, Karen is a founding member of both the Greater Indianapolis Flute Club and the Indianapolis Baroque Orchestra and a former coordinator for the National Flute Association’s Young Artist Competition. She has performed and presented at several of the NFA’s national conventions. As a registered (RYT200) yoga instructor, Karen teaches at several yoga studios in Indianapolis and often incorporates mind/body techniques in her flute teaching as well. Along with ISO violinist Victoria Griswold, Karen has partnered with the ISO’s Human Resources department to bring morning and lunchtime yoga classes to the ISO musicians and staff. Her volunteer work with the Julian Center has included starting a program to bring yoga classes to the shelter residents. Karen lives in Indianapolis with her husband, George Evans, who owns the advertising and digital marketing agency Brandwidth. He is also a published author, plays guitar, bodhran and Native American flute, and has sung with the Heinz Chapel and Indianapolis Symphonic Choir. "I am always in the mood for Mozart. After all, my last name is an anagram for Mozart!"